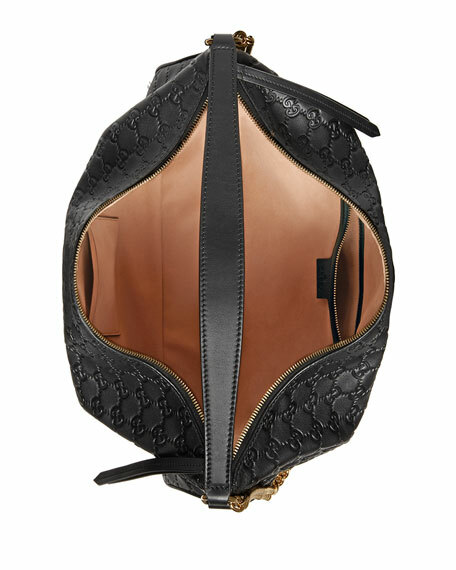 Gucci large hobo bag in Guccissima leather. Flat top handle, 9" drop. Curb-chain shoulder strap, 21.5" drop. Inside, one zip and two slip pockets. 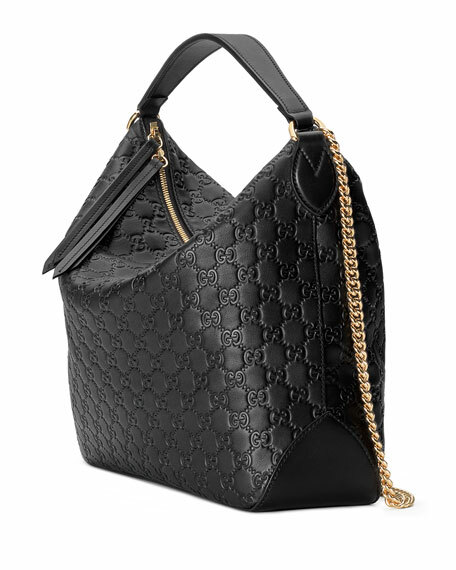 12"H x 15"W x 4"D.
Gucci smooth leather top handle bag with golden hardware. Adjustable top shoulder straps with snap ends, 13" drop. Dual recessed zip top compartments. Exterior, interlocking GG at center. Interior, contrast fabric lining. One zip pocket; card slots. 7.5"H x 14.5"W x 3.5"D. Made in Italy. Gucci GG supreme canvas shoulder bag with hand-painted edges. Antiqued silvertone hardware. Sliding chain strap can be doubled, 9"-15.8" drop. Gucci GG supreme canvas shoulder bag with hand-painted edges. Antiqued silvertone hardware. Sliding chain strap can be doubled, 9"-15.8" drop. Flap top with textured tiger head spur. Magnetic closure with side release. Suede flap pocket under flap. 6"H x 7"W x 2"D. "Dionysus" is made in Italy. Gucci smooth satin shoulder bag with palladium-tone hardware. Sliding chain shoulder strap can be doubled, 12.6-22.8" drop. Layered flap top with crystal tiger head spur. Pin closure with side release. Pocket under top flap. Interior, suede lining. 5.3"H x 9.8"W x 2.8"D. "Dionysus" is made in Italy. 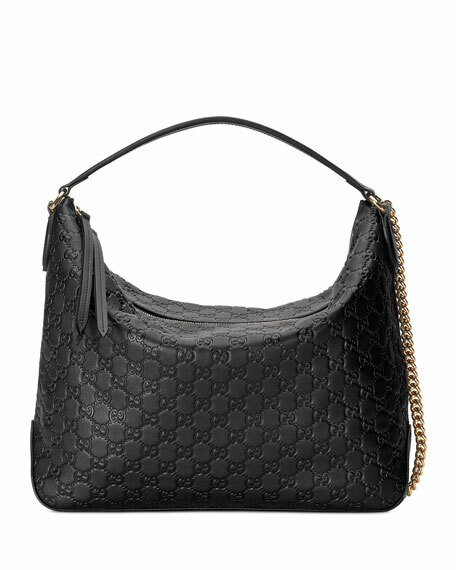 Gucci crossbody bag in chevron-quilted leather. Antiqued golden hardware. Sliding chain strap can be doubled, 11.5"-22" drop. Flap top with interlocking GG; push-lock clasp. Exterior, quilted heart at back. Interior, sueded microfiber lining; one slip pocket. 5"H x 8.5"W x 2.5"D. "GG Marmont 2.0" is made in Italy.